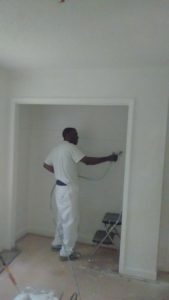 If you are looking for a Guilford County, NC Painting Contractor, you have come to the right place! American Renovations is a full-service interior and exterior paint contractor serving Guilford County, NC and the surrounding metro area. We are THE painting contractor Guilford County, NC calls on for detailed estimates, competitive pricing and on-time appointments. Whether you’d like to paint an accent wall, or the entire interior and exterior of your house, no job is too small, or too big for American Renovations. We always go the extra mile for our customers to ensure there is minimal disruption to your household or business. American Renovations will complete your painting project beautifully and on time. We have built a reputation for being honest, affordable, and most importantly, top-quality service in the metro Guilford County, NC area. We offer not just painting services but top-quality, in-depth remodeling and restoration including Roofing, Painting, Siding, Gutters, and General Carpentry. We invite you to come visit our recent projects to see for yourself the craftsmanship we have been providing for over 10 years – You’ll be glad you did.